Jarandilla is found in central Spain directly west of Madrid. The Celts were the first to settle here, followed by many other different civilizations over the centuries. From the Romans to the Arabs, each left behind magnificent monuments built during their rule which still stand today. Some of these historical sites include two Roman bridges and a necropolis (an ancient Roman cemetery). In one of the squares stands the pillory which was a stockade used in the Middle Ages to publically humiliate and punish those who broke the law. It was very much a symbol of feudal power. 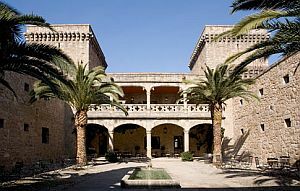 The town’s most prestigious monument is the 15th century palace of the Counts of Oropesa. This was where King Carlos V of Spain based himself in 1556 for several months whilst the Yuste Monastery was being refurbished. 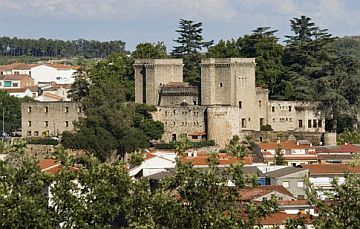 The King had decided to abdicate in favour of Philip II and wanted to retire to the monastery. However, work had to be done on it first to ensure it could accommodate both he and his rather large entourage. Today the palace is now the Parador Jarandilla de la Vera (Hotel Carlos V). This stunning luxury four star hotel is visited by guests from all over the world, and surrounded by beautiful ravines and fruit orchards. It has retained many of its original features and at the same time offers all the comforts of modern living, including a seasonal swimming pool and excellent restaurant. Continuing on the quest to explore places of architectural interest, the house of Don Luis de Quijada is worth a visit. Don Luis de Quijada was the tutor of King Carlos V's illegitimate son, Don Juan de Austria, who later became one of Spain's great military leaders at that time. If you have a particular interest in religious architecture, there are also a number of ancient churches and convents. The Sopetran Hermitage is located next to the pillory and the Convent of San Francisco is still very interesting, even though it is only a ruin, for you still get a sense of its size and presence. For many visitors the Vera and Jerte Valleys are a huge draw, and likewise the stunningly beautiful Monfrague National Park which is north of Trujillo. The park runs along the valley of the Tagus River and is particularly popular during the spring and autumn months as this is when the weather is at its best. There is only one village in the park and that is the Villareal de San Carlos. From here you can hike along the marvellous trails through the two gorges that surround the village, and cross over one of the many old Roman bridges. If you want to try something different each day there are several outdoor activities to enjoy in the area which include mountain biking, horse riding, and canoeing. There are also wonderful crystal clear natural pools that are perfect for swimming. At particular times of the year Jarandilla celebrates several rather special festivals. Easter is the start of their 40 day Carnival and in September is the Cristo de la Caridad which involves a bit of bull dodging. However, Escobazos is their biggest tourist attraction. Held in mid December, there are bonfires dotted around the town, a horseback display, and a procession led by horsemen in costume with people on foot carrying massive brooms set on fire. This popular celebration is certainly a spectacle and visitors are also treated to all the local food and wine which is served in abundance. So if you fancy taking part in something a bit different around Christmas time, you might want to consider Jarandilla de la Vera.